Let's all cry together, shall we? 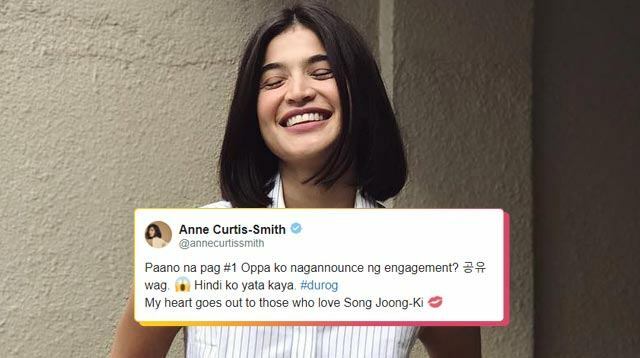 Anne Curtis, K-drama superfan, is known to be absolutely ~*obsessed*~ with Korean superstar Gong Yoo. But the actress has also watched a slew of other Korean movies and series (yknow, to beef up her K-drama fangirl cred), including the mega-hit of 2016 Descendants of the Sun (DOTS). Yesterday's surprise engagement news of DOTS co-stars Song Joong Ki and Song Hye Kyo left all fangirls and boys SHOOKT to the core. Not surprisingly, Anne's Twitter reactions were the ones we could all relate to. Like Anne, we were all initially rooting for their union. C’mon, this was a match made in K-drama heaven! But then, yeah, it then dawned on us that our oppa is legitimately a taken man. And that leaves us, to be perfectly honest, HEARTBROKEN.